Love…the only thing more powerful than death. Seventeen year old Ruby Matthews spent the last year of her life crippled by guilt and grief over the death of longtime friend and boyfriend Seeley “Lee” Lucas. Feeling that a change of scenery might snap her back to reality, Ruby’s father moves the family out of their home in the Philadelphia suburb of Trinity and into small town life in Charlotte’s Grove, Pennsylvania. Life is better here for Ruby—she quickly makes friends with handsome Zach Mason and his twin sister Rachel. Every moment spent with Zach makes life and love seem possible again. But passion comes with a high price. Things are not what they seem at Rosewood, the Matthews’ historic plantation-style home. Paranormal activity at the mansion intensifies as she draws closer to Zach. Is it Lee—coming back to claim her heart and maybe even her soul? Or is something more sinister hiding in the shadows? Ruby must delve into her own past and the history of Rosewood before it is too late. I jerked away from the table, nearly burning myself on a candle in the process. We took one look at each other. One thing was clear. We needed to get out of there. One by one, the candles extinguished themselves around the circle, wispy trails of smoke drifting up in their wake. Another flash of lightning lit the room and I saw that we were not alone in the attic. A dark shadow hovered closely behind Rachel. “It’s behind you!” I reached out frantically to pull her away but it was too late. The entity rocketed forward and dove straight into her. Rachel’s eyes flew wide and her face contorted into a vision of agony. I watched helplessly as she doubled over and the shadow figure forced itself out through her stomach and disappeared. She crumpled to the floor lifelessly. “No! Rachel!” I rushed to her side, afraid of what I was going to find. I grabbed for her wrist and felt a weak pulse. I breathed a sigh of relief—I couldn’t be responsible for another death! “Rachel! You have to wake up! We have to get out of here!” I took her by the shoulders and shook her hard but she bobbled limply like a rag doll. I sunk to the floor beside her and cried. A thundering crash resonated behind me. And then another. And another. I opened my eyes to see my books flying off of the shelf one at a time and hurtling across the room. I had to get us both out of there. I was too weak to carry her so I gripped her by the ankles and dragged her toward the door, book bombs exploding around us as I went. Suddenly, a weak groan rose from her throat. “Rachel, we have to get out of here! You need to get up—now!” I slapped her sharply across the face. It always seemed to work in the movies—it was worth a try. I could tell when the initial confusion wore off because a look of mortal terror replaced it. Just then, the door flung open and a looming figure appeared in the doorway. A piercing scream escaped my throat as it seized me around the waist and pulled me toward it. Tell us something we won’t find in your author bio. I have tons of dirty little secrets! Hmm, now to narrow it down to one that I’m willing to share. Well, there’s the fact that I...no, I better not tell you that one! Okay, here’s one...I didn’t get my driver’s license until I was 31! Where do you find it most comfortable to write? At my desk in my writing room/dressing room. I have one spare bedroom devoted to nothing but my clothes, shoes, jewelry, etc. Putting my desk in there was a brilliant move on my part because everything in that room makes me happy! Yes, I’m very painfully a girly girl. Have you always wanted to write paranormal novels? I’ve gotten the urge to write off and on throughout the years but I never felt like I really had a story to tell until Ruby came into my life. How did you come up with your characters’ names? I didn’t really have a system for naming my main characters...I just took their personalities into account and decided on names that suited them. What was your inspiration behind The Haunting Ruby Series? I’ve always been fascinated with ghosts and other aspects of the paranormal. I’ve never been as in tune with ghosts as Ruby is (and hopefully never will be! ), but I have had some personal experiences with them in my life. 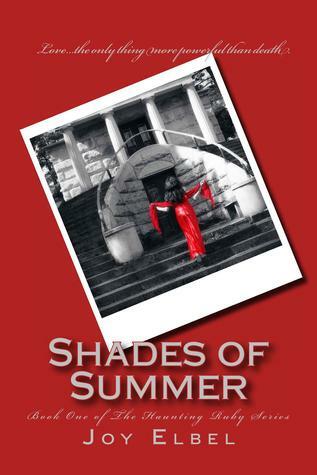 Which book did you enjoy writing more: Shades of Summer or Phantoms of Fall and why? Phantoms, definitely Phantoms. By the time I finished Shades, I was more confident about what I was doing and where the story was going so I was able to relax and enjoy it more. Last message before we head on to The Lightning Round? If you have a story to tell, tell it. Even if no one but you ever reads what you write, write it anyway. My all time favorite movie is Clue. I just love the sheer craziness of it and know practically every line by heart. New Orleans for the sheer mystery of the city or Egypt for the pyramids. Besides Zach Mason? Lol, I am team Jacob all the way! For other giveaway mechanics click Terms & Conditions at the bottom of the Rafflecopter widget. Sounds like a good read with some edge of your seat tension thrown in! Great excerpt. The suspense created caught my attention and makes me want to read the book to find out what will happen next. Thanks for the giveaway.